Downtown off of traffic light number 2 & with in walking distance to strip!!! 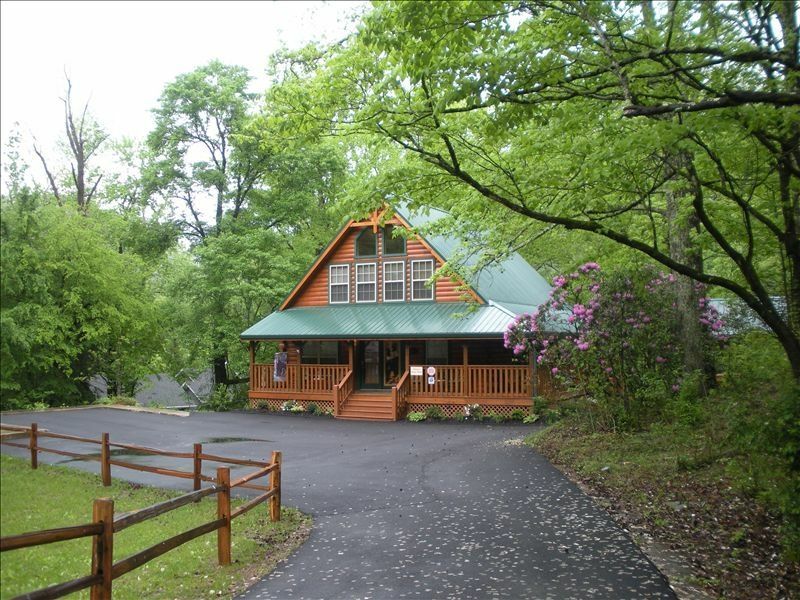 'Nature's Retreat' is just that, it sits on a beautiful lot with endless peace and quiet and is located down town Gatlinburg with in footsteps to the parkway. This is a prime location! This luxury log home will provide the sanctuary that you have been looking for in a vacation home. The cabin is beautifully furnished, it has all the upgrades, high speed internet,free long distance, plasma TVs in every room, pool table, gazebo with a large hot tub, covered porches with a swing, rocking chairs, patio set, a large yard with a picnic table and stationary park style grill, kitchen has granite counter tops, stainless appliances,seating for up to 9 persons,3 bedrooms and three baths, two king master suites, one queen bedroom and a hall bath, there is beautiful stack stone rock work throughout the house and much more, you will want to stay forever. Gatlinburg is known for its wildlife, National Parks and area attractions, you will be able to enjoy seeing some of the local wildlife at this cabin, it is nothing to see bears, deer, racoons, birds and we even have a beaver that makes his way through almost daily. You will be able to walk to the area attractions, restaurants and shopping on the parkway. Keywords: Luxury log cabin with all the extras, borders the National Park and with in walking distance to the strip, dining, shopping, mini golf & area attractions, large yard with large paved parking area. This cabin was built and completed in September 2008, location couldn't be better, it is close to area restaurants, mini golf, theaters, the Little Pigeon River, Natioanl Park and more. It has all the extras and luxuries to make your stay amazing. We work very hard to keep the cabin up to date and keep the newest, cleanest feel possible. With in walking distance to the strip down town, located off of traffic light number two and is 1/4 mile distance to the strip and nearest trolley stop, peaceful setting where you will see Bears, racoons, deer and more come through daily, the property borders the National Park as well. This property has a large, level parking area and a nice side yard with stationary park style grill, gazebo with hot tub and picnic table. We provide all towels, full size bars of soap, liquid hand soap and 2 rolls of toliet paper for your stay for each bathroom. All linens, sheets, towels, kitchen towels, blankets etc are provided for your stay. All bath and kitchen towels are provided. stainless dishwasher, we provide the dish washing detergent and liquid dish soap for your stay. Kitchen is fully equipped for preperation of any meal. slate top, solid wood pool table and dart set. Nature's Retreat is the perfect family cabin. Our family thoroughly enjoyed our stay. This cabin is beautiful and located in the perfect location! It has all the comforts of home. We cannot wait to stay here again. The house was very nice! Lots of space for everyone. Great kitchen. And we loved the porches. We were very happy with the place. The narrow road was a little scary. My family and I enjoyed every part of our stay at "Nature's Retreat". The cabin was clean, the bedrooms were comfortable, and the kitchen was well stocked. The porches were perfect for a couple of hammocks , and the hot tub just rounded out the place perfectly. I would definitely come back to visit here and it recommend it to my family and friends. Thank you fr providing a nice place to relax and unwind for a few days! Perfect place and the owner is fabulous! We stayed here for a girl's weekend! We had a blast and everything was immaculate. The owner went out of her way to be available to us during our stay! Beautiful cabin! Was perfect for our vacation!